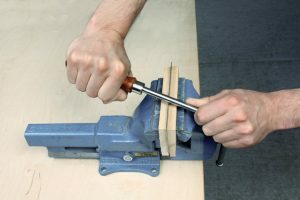 Scrapers are usually stamped, which means the edges must be worked with a file to obtain an evenly square edge, using one of the following methods: There are file holders with a 90° fence which allow even less-experienced users to control the file securely. You can make similar holders of wood yourself. 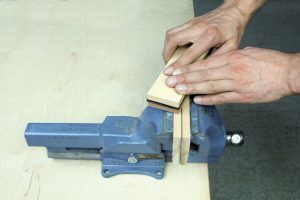 But the simplest and cheapest method is clamping the scraper between two pieces of wood. You can now feel the raised burr with your fingertips. Depending on how hard the scraper and the pressure applied, you may need to burnish the edge again. However, you should not burnish more than three times, as each process may ruin the even burr. The deeper the angle used in burnishing, the larger and more »aggressive« the burr. How large a burr is required depends on the intended use: Removing varnishes and coats requires a large burr. Surface finishing requires a small burr. You can also right the burr with the burnisher and raise it anew, but this process does not usually produce consistent results. We therefore recommend completely removing the burr on worn scrapers with a file before raising a new one.